Brazilian/Italian. Graduated in Business Administration. Certified Supply Chain Professional by APICS. Member of the Swiss Council of Supply Chain Management Professionals – Young Professionals. Supply Chain Operations experience in both Fast Moving Consumer Goods and Pharma. Involved on the negotiation and procurement of components, setting up a standard process directly with Suppliers, taking into account Service Level and Inventory Targets. 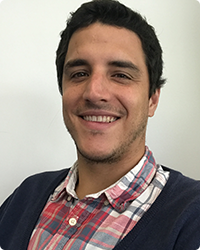 Murilo has a vast international experience as he lived, work or studies related, in 7 different countries, broadening up his cultural and knowledge levels. Married and currently living in Switzerland, Murilo enjoys the good things about life: Wine, travelling, books, sports, friendship and cigars.